In the earlier models, Farnell Guitars patented construction methods produced incredible sound quality in an ultra-light body - approximately 1/3 to 1/2 the weight of other guitars and basses on the market today. As seen from these cross-sectional photos, Farnell's unique construction allowed for a perfect combination of weight and sustain. First, we started with the mahogany insert. This initial feature of the Farnell process provides for low-end bass tones and warm creamy sustain. 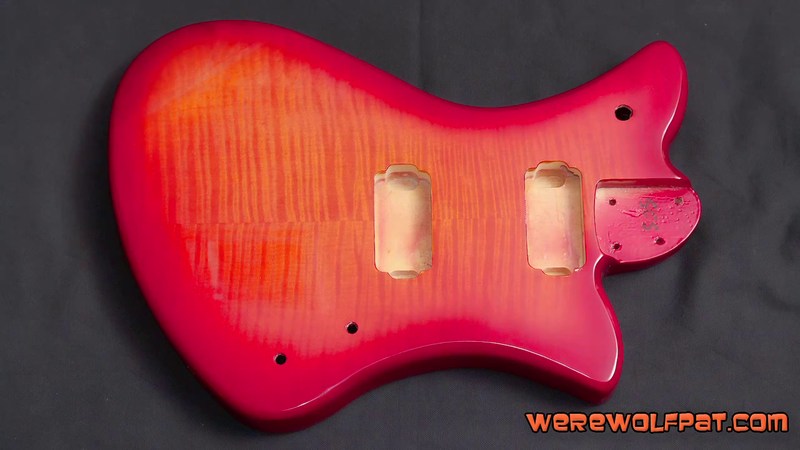 This also insures a stable neck to body joint as well as a solid base for the optional tremolo. The mahogany insert runs from the neck joint to the end of the guitar body. The next step featured a closed-cell polyfoam engineered body, that is attached to the insert. 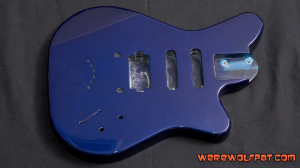 This formed the patented "sound reservoir," which literally surrounds the pickups in sound! This creates unbelievable sustain, attack, and major tone enhancement. Then, the durable fiberglass/composite casing provided incredible high-end cutting tone. Finally, we wrapped the guitar like a surf board in a special fiberglass that produces a strong, clear, durable finish. Premium models featured a flame maple veneer as well as a wooden veneer on the back which gives the impression and aesthetic of traditional construction while creating very little waste. Responding to the demand for careful conservation of our natural resources, Farnell Guitars offered the world's first alternative to an all-wood guitar that sounds as good, if not better, than an wood-bodied instruments. In our latest incarnation, we utilize injection molding of the body materials from a high-impact thermoplastic composite. This makes the guitars more economical (which translates to more affordable to you), and more versatile. There's a greater upfront cost with development of new body shapes, but once molds are created, reproduction becomes very efficient. This allows us to create a shape once, and once the bodies are molded around the solid light mahogany center block, we can route them on demand for any options you like, from different bridges and tremolos to an infinite variety of pickup combinations and control layouts. If you can dream it, we can build it...and we can deliver it faster than any other custom shop.